If you cast your mind back to childhood – those of you still there, should simply stay right where you are, existentially-speaking, you will recall a tired old routine much indulged in by your parents. It began with an almost pleading entreaty by your parents to please play happily with your sibling/s, an idealistic call which often went unheeded despite your best intentions not to get on the bad side of your parents, and resulted in, hours, days, weeks but usually nanoseconds later with a threat to take away the items you were playing with, and remove them from the cycle of childish fun, temporarily or completely. It’s that hapless dynamic, borne of exasperation and exhaustion than from any real hope that parental prayers would be answered, that provides the meta-narrative that powers The Lego Movie: The Second Part, a film that suffers a little from the diminution of the novelty of its 2014 predecessor, The Lego Movie, but which mostly powers every gleefully onwards, suffused with the same irreverent spirit that has made these films such an irreverent joy. With the big reveal from the first film – SPOILER ALERT! – that Emmet (Chris Pratt), Lucy (Elizabeth Banks), Batman (Will Arnett), Unikitty (Alison Brie), Benny the ’80s spaceman (Charlie Day) and the other mini-figures were all playthings of a boy named Finn (Jadon Sand as the older boy, Graham Miller as the younger), with the film ending on a somewhat conciliatory note where son and father (Will Ferrel), the Big Bad of the piece, reconciled, the second film is free to play fast and loose with the narrative around in all kinds of interesting ways. For a start, we now know that Emmet et al. are simply living out the playtime fantasies of Finn, and his sister Bianca (Brooklynn Prince), who are expected to play together with their respective Lego toys – Finn old school, Bianca with Duplo (as a young girl and now Friends now she’s older) but while that could be seen as ruining the fun conceit of The Lego Movie, Phil Lord and Christopher Miller, the parodically-funny minds behind both films, made merry use of it. Throughout the film, where Bricksburg has now become the very Mad Max-ian world of Apocalypseburg, where strange brightly-coloured and relentlessly-cheery, smiling assassins in the shape of hearts and smiling faces, wreak endless havoc with Emmet’s once-awesome perfect world, we are given glimpses into the way Finn and Bianca, at war with each other but not as full of enmity as either might think, are shaping events. 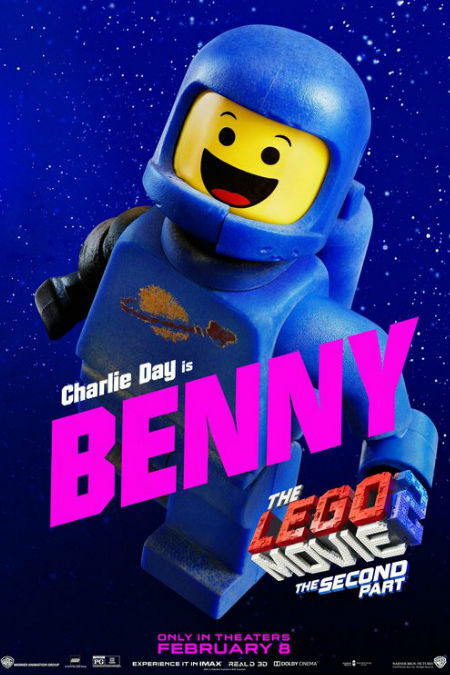 A Lego ship bursting through space, in this space, driven by swarthy, derring-do pilot Rex Dangervest, who’s an amalgam of every blockbuster role Chris Pratt has ever played, is revealed in fact to be a ship on a string racing against a drawn-background. Is the magic lost with that drawing back of the Wizard of Oz-ian curtain? Not a bit; in fact, the glorious imagination at work, both in the respective and clashing play worlds of Finn and Bianca, and by Miller and Lord themselves, only glows brighter as we see how powerful it can be when applied with the intensity of childhood (and adults who never quite grow up which, if it results in movies that are this much fun, is never a bad thing). By cutting between the very real and very vivid adventures of Emmet, Lucy and the others, and their “adversaries” such as Queen Watevra Wa’Nabi (Tiffany Haddish in stellar form), and Finn and Bianca, though we don’t always see them, the power of play and imagination is brought to the fore and we can appreciate, if we have forgotten, how divertingly epic and alive the play dreams of childhood actually are. 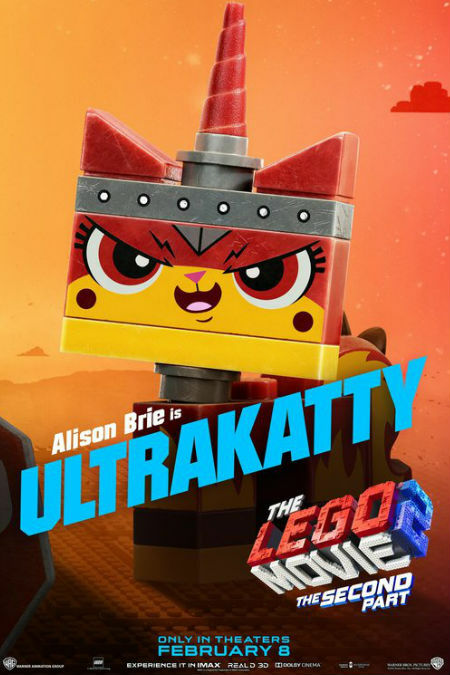 That there is going to be some sort of The Lego Movie warm and fuzzy ending is beyond doubt, but how Lord and Miller get there is an enormous amount of quip-heavy fun, suffused with a willingness to parody just about everything in sight once again. Everything is fair game – from Batman himself who is self-reverential to the point of hilarious mockery, to the songs which punctuate the film and the credits with brilliantly-comedic skewering intent through to the sending up of superheroes, dystopian storytelling and the characters themselves, The Lego Movie 2 whips along with a eye-blindingly colourful irreverence for pretty much everything that moves. That kind of high-intensity parodying hilarity might get tiresome after a while, deliciously funny though it is, were it not for the fact that it is balanced by a tremendous amount of heart. Not so much, of course, that you’re reaching for your popcorn bucket for a spirit bit of emotional vomiting, but enough that the film actually means something, imbuing the narrative with a reason for being beyond wisecracking and sending up. Even better, it takes you back to your childhood in the best possible way, reminding you that all those times, you thought your younger siblings were trying to make life difficult for you, perhaps all they wanted to do was play? 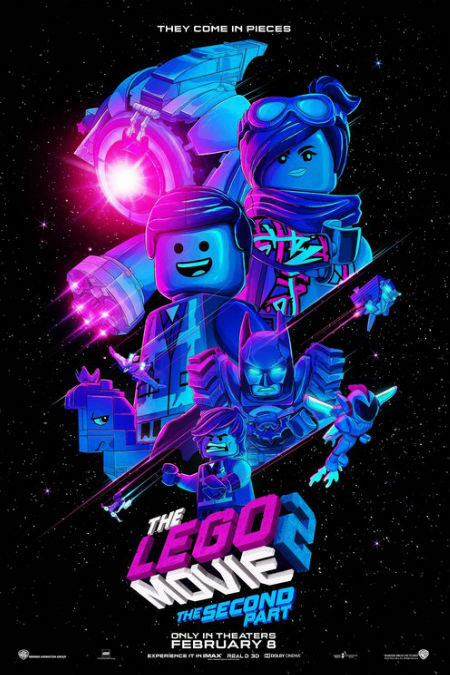 It’s a pretty much perfect balance that gives The Lego Movie 2 the feeling of a fully, well-rounded film, which while it’s not always on point, suffering at times from the tiredness that comes from sequel-itis, is entertaining as hell. What might have happened perhaps if you’d had the vantage point of adulthood to inform all those childish battles for supremacy, the kind that resulted all too often in the play-less void of The Stor-age Bin? Short of getting ourselves a Delorean (yes Back to the Future gets a humourous guernsey too), we’ll likely never know how it night have turned out, but The Lego Movie 2, bristling with all the fun, colour, exuberance and silliness of childhood, comes as close as we’re ever likely to be to finding out, a film that celebrates with wit and colourful fervour the power and adventure of the imagination even as it lets it loose on our collective, pun-embracing adult psyches with invigoratingly-uplifting results.